You can use MS debug format to get information for system DLLs. By default Windows comes in "release" version - i.e. without debug information for system DLLs (so-called "free build"). This prevents you from getting proper information. In fact, you only can get heuristic information based on DLL exports. However, you can ask Microsoft for debug information and get full coverage for Microsoft DLLs. Basically, when your application needs debug information about system DLL - it can ask Microsoft server for specific version of system DLL and download corresponding debug information file. Unfortunately, this process is not well-suited for end-users machines, but acceptable for developers machines. This information can be used not only by EurekaLog, but also by other tools. 1. You'll need a good internet connection. 2. A lot of free disk space (about 512 Mb). 3. You need to create a writable folder which will be used as local cache. 4. You have to use the latest DbgHelp.dll. Default DLL which ships with Windows will not work. Use DLL either from Microsoft Debugging Tools for Windows or from \Bin (\Bin64) folders of EurekaLog installation. 5. You have to setup retrieving debug information (see below). Warning: using this process will slow down building call stacks and bug reports in your application - because information will be downloaded from the internet. This is especially true for the first time use, when many information needs to be downloaded and it not present in the cache. Therefore you should disable hang detection in your application. As you can see - entries from User32.dll are confusing. Some of them mentions only "possible" match and this match is usually wrong. This is the best that you can do without debug information. As you can see - entries from User32.dll are now correct. 1. "DbgHelp.dll path" option specifies full file name to DbgHelp DLL. You can find it in EurekaLog's installation folder (like: C:\Program Files (x86)\Neos Eureka S.r.l\EurekaLog 7\Bin\dbghelp.dll). You can also change this path to alternative library. This is DLL from Debugging tools for Microsoft Windows. 2. "Cache" option specifies read-write folder to be used as cache for debug info symbols. It's empty by default, which means disabled feature. You can click on "Use defaults" button to set default preference (which is sub-folder in your %APPDATA%, for example: C:\Users\User\AppData\Roaming\Neos Eureka S.r.l\EurekaLog\SYMBOLS) or select your own folder. Be sure that this folder is writable and disk have some free space (500 Mb minimum). This cache folder is used by MS Debug info provider to store debug symbols for system libraries. 3. 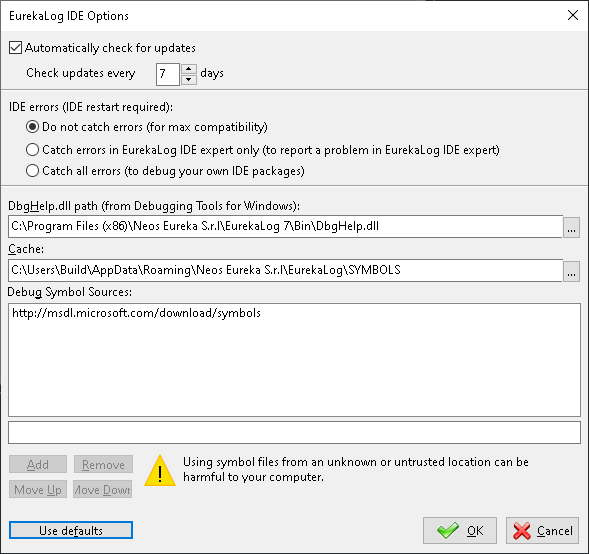 "Debug symbol sources" option specifies debug info sources for MS Debug info provider. You can add one or more sources here by using edit-box and buttons below. Source can be local folder (like: C:\Symbols), shared network path (like: \\server\symbols) or URL of symbol's server (like: http://server/symbols). It's empty by default, which means disabled feature. You can click on "Use defaults" button to set default preference (which is default Microsoft's symbol server: http://msdl.microsoft.com/download/symbols) or select your own sources. To quickly enable feature - you can just click on "Use defaults" button and close options dialog via OK button. To disable feature - remove all debug symbol sources. To enable feature - select DbgHelp.dll, specify path to writable folder, add URL, and click on "Set for EurekaLog" button. 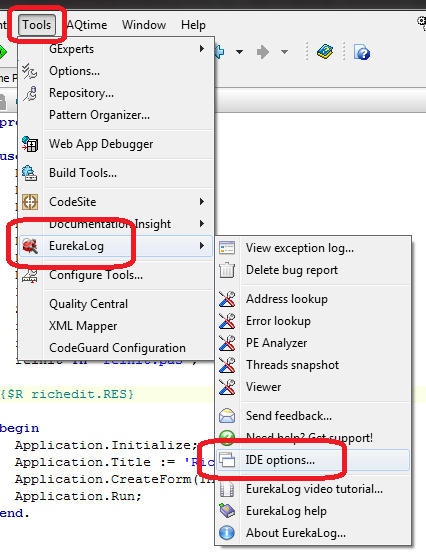 To disable feature - remove all debug symbol sources and click on "Set for EurekaLog" button. You can also use the similar feature in other debugging software. You can use "Set Debug Symbols Path" tool to setup this feature or you can do it manually. To setup it with "Set Debug Symbols Path" tool - copy \Bin\SetDebugSymbolsPath.exe file to another machine, run it, specify all data and click on "Set for Process Explorer tool" to set these settings for Process Explorer tool or "Set other" to set these settings for any other tool. To use "Set other" button you need to run the tool under administrator account. 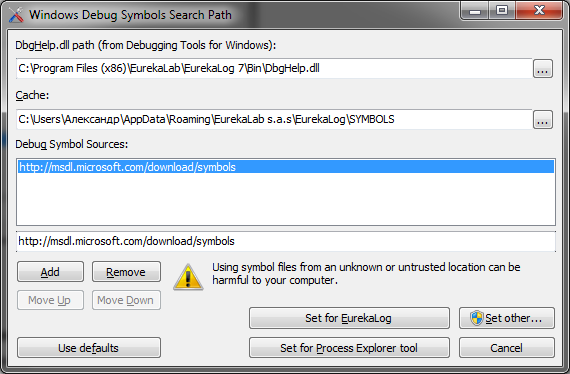 Then you'll need to enter this string into your tool as "Symbols path" folder. Refer to documentation of your tool on where to find this setting. For example, for Process Explorer tool you can find it under "Options" / "Configure symbols" menu item. Any EurekaLog-enabled application can use Microsoft symbols to get information about system functions when building call stack. You can enable this feature by checking "Microsoft DBG/PDB" option in debug information providers configuration.